Gulf Coast State College (GCSC), Corporate College added two new members to their team. 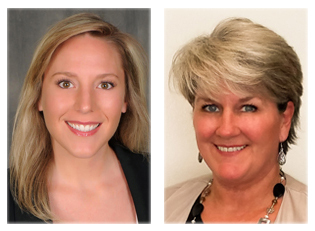 Katrina “Kat” Andrews joins Corporate College as Program Developer/Coordinator for business and industry, and Lara Herter joins Corporate College as the Program Developer/Community & Education. Kat has more than 27 years of experience in the field of business and industry. Most recently, she worked as a director of public affairs and protocol with the Air Force where she led community outreach efforts including presentations, training seminars, event planning and creative design. This background has helped Kat to make a smooth transition into her current position with GCSC Corporate College. Lara graduated from Florida State University with a Master of Science Degree in Corporate and Public Communication. She brings a wealth of experience in customer service, training and development of talent, visual merchandising and creating loyalty with clients. She has a background in marketing research, analysis, strategic marketing plan development, and evaluation.